I created this card using I Love You This Much from Sassy Cheryl's. I started with a red card base and added a piece of powder blue card stock backed in white to it. I added a piece of red card stock that I punched using a star border punch to two of the corners. I punched a strip of white card stock with the same punch, backed it in red and added it to the middle of the card. I colored the image using Spectrum Noir pens and backed it in red. I added a blue glitter button to two of the image corners and then added garnet red glitter to the dots on the image. Happy, fun card Mary! I like the way you used the star border punch. It is perfect for the “Red, White and Blue” Challenge - good luck! Very cute card. I am working on a card using the same sketch tonight. It is a lovely one. Lovin those red sparkling shoes Mary. Your coloring is right on and those stickled dots are the perfect finishing touch. Great use of the star border punch too! Thanks for playing with us at Sassy Cheryl again this week. I always love seeing your creations. Adorable card! Great details. Thanks for joining us at Inky Impressions. This is one of my favorite images! I love the layout! Thanks for playing with us at Loves Rubberstamps! Oh wow, Mary, this is just adorable! One of my favorite images. LOVE your coloring and those stars are just the PERFECT accent! 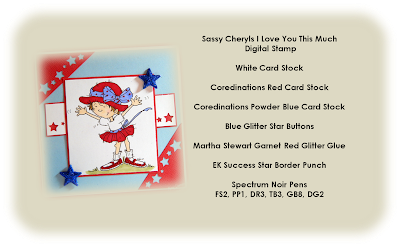 This red, white, and blue card is adorbs! The sparkly stars just make it that much better! Thanks for joining us here at Sassy Cheryl's. Your card is so beautiful! Love the card layout and the cute image. Thanks for joining us at Loves Rubberstamps this week! Fantastic card I love the image and the colours you have used look fabulous together. Super sweet. I love the punched border. Thanks for joining us this week at CYP for our "Red, white and Blue" challenge. OMGoodness...she is so cute I just want to hug her back! Fabulous card...great colours. Well, now, this just makes me grin! 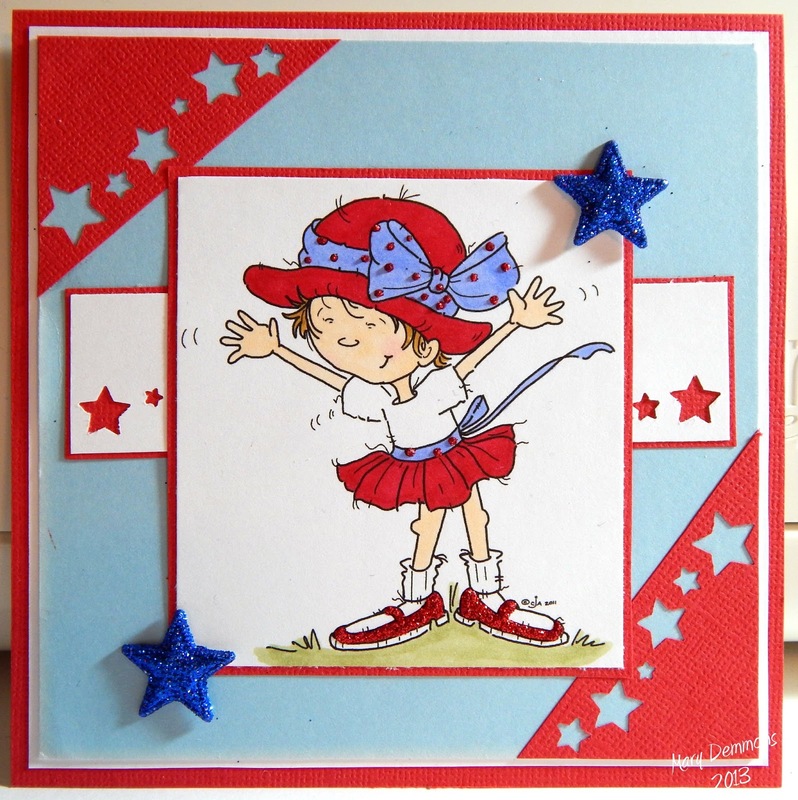 Such a fun, cute card and holiday red, white and blue! Love it!!! Thank you for joining us this week for the Sassy Cheryl's challenge! It looks fantastic, love the wonderful creation of yours! Thanks a lot for joining us at Sketch N Stash this time! SUCH an adorable card! I just love her shoes! Thanks so much for joining us over at the Simon Says Stamp Challenge Blog!